Silverback Lodge boasts sweeping views of the valley and the forests and accommodates guests in 12 rooms, each built using local materials. 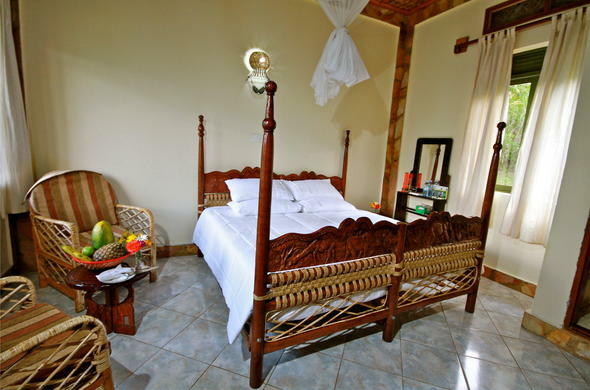 Gorilla Safari accommodation in Bwindi Impenetrable Forest National Park, Uganda at Silverback Lodge consists of 12 rooms, designed and built using local resources and materials. The en-suite bathrooms are equipped with showers and each room has a private veranda for viewing the surrounding valley. The lodge's restaurant serves international classics and special local meals. Lounge around at the Summit Bar with a refreshing drink and shared stories of the day's events. The manicured gardens create a tranquil feel and allow you to relax after an adventurous day outdoors.